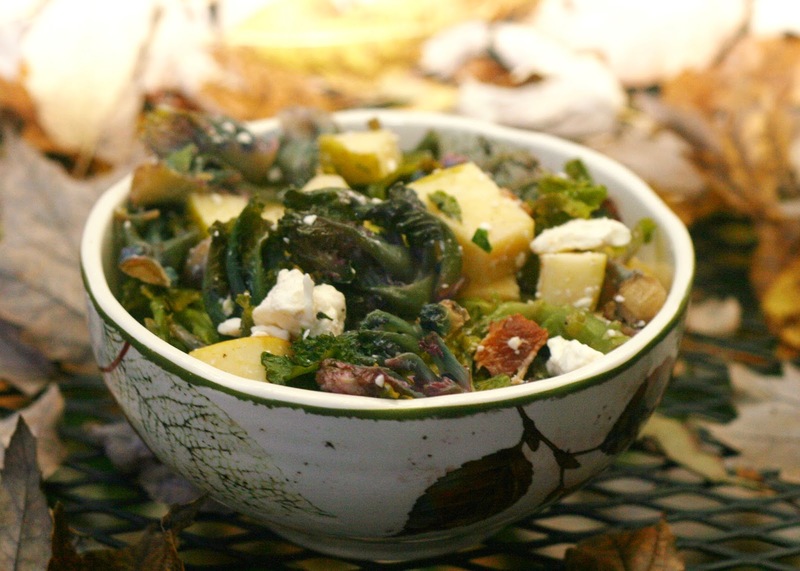 Toss together the bacon, kalettes, feta and apple in a medium bowl. Drizzle with vinegar, oil and sprinkle with salt and pepper. Toss to coat. My mom called me all excited about a new vegetable she had read about in a magazine called kalettes. It is a cross between kale and Brussels sprouts. I'm a little eh about kale but I like Brussels sprouts so I wanted to give it a try. I couldn't find it anywhere so I finally emailed the kalettes people via their website and they said it is mostly available in California but some Trader Joe's nation-wide sell it under the name "kale sprouts". I do not really care for TJ's (mostly because of many bad experiences at our local one) but I did manage to track it down. I did some experimenting to come up with this salad. Raw, the kalettes were a bit bitter and too tough but a quick steam and cooling took the edge off enough that they could be used in a salad. So, it was a little more work than just tossing them in raw but it the salad was hearty and tasty despite the simple ingredients.